Developing language should be a main focus of a preschool lesson plan. Planning lessons for preschool children can be challenging since young children are at varying stages of development. Preschool children learn best when they play,and early childhood education centers are an ideal setting for this type of learning. It’s important to consider each lesson as an isolated experience that focuses on one developmental aspect. As lessons are formulated, they can be connected to form a unit that follows a thematic concept. Begin by establishing learning goals and crafting a plan. Align lessons with state and school curriculum standards. Lessons should be written clearly so they can be implemented by any teacher. Include the time it will take to teach the lesson, age-level and supplies needed. 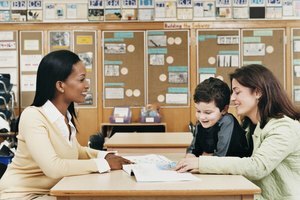 Preschool children have varying abilities, so be sure the lesson will address diverse learning needs. Finally, consider the skills needed to complete your lesson. For example, if your students must be able to use scissors or count to ten, be certain that the entire class can meet these requirements or that help is provided for students who need it. Preschool children enjoy hands-on activities and learn best by doing. Your lesson plan should include activities that engage your students and involve small and gross motor skills. Singing songs, playing games and engaging in dramatic play provide interactive learning opportunities. Lessons should encourage children to question and initiate learning. Make learning fun by providing a balance of cognitive and affective activities. Disguise learning with active experiences that create make educational moments common. For example, create a game out of brainstorming words that rhyme. Preschool children need regular opportunities to review learned skills. Lesson plans should reflect this by repeating lessons in differing formats. Structured content that helps children practice new skills and reinforce concepts will help solidify learning. If a lesson isn’t well received at first, change it up and try it again. If it’s well received, introduce it again to help preschool students feel even more comfortable with the material. Building confidence in young children should be a main focus of a preschool lesson plan. Including assessment in your preschool lesson plan will help you evaluate if your methods were successful. Consider your objectives and the way you’ll know if your preschool students have accomplished the lesson goals. You can observe each child and how they respond to your teaching. If possible, create a checklist or rubric that enables individual evaluation of the skills you taught. Adjust future lessons based upon progress your preschool students make. Keep records of your success so that you can inform parents of potential deficiencies and accomplishments. Kelly, Dr.. "Guidelines for Preschool Lesson Plans." Synonym, https://classroom.synonym.com/guidelines-preschool-lesson-plans-36638.html. 26 September 2017.